One of the most powerful weapons in a man’s sartorial arsenal, the blazer is that rare item of clothing which, when slipped on, has the ability to instantly alter how you look. Timeless, versatile and masculine, it brings a touch of sophistication to whatever you’re wearing it with – whether that’s a simple T-shirt and jeans combination or a pair of tailored shorts with an Oxford shirt. 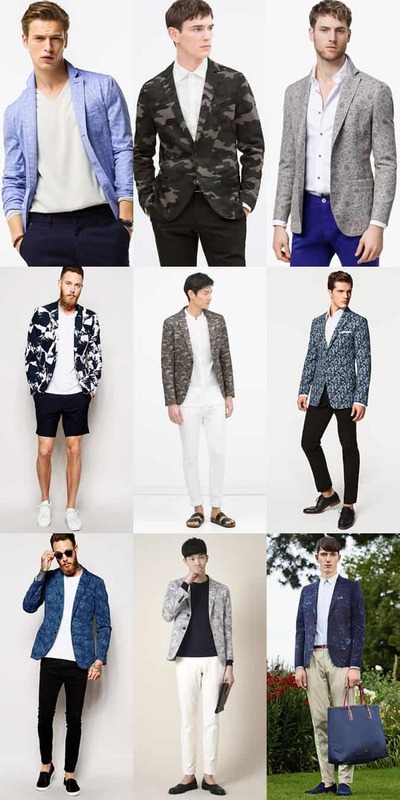 With summer set to (hopefully) hit in earnest soon, a blazer will serve as the ideal outer layer, with this season’s stellar options ranging from the boldly coloured to the breezily lightweight. 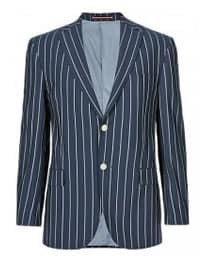 One of our 5 key pieces for spring/summer 2015, the striped blazer is having a moment and offers a welcome alternative to the ubiquitous checked styles that have started to dominate the industry. Advocated by the likes of Gucci and Dior Homme on the SS15 runways, the high street has been quick to pick up the trend, with everything from block-stripe designs to traditional pinstripe options available on the current market. That said, our favourites are crafted from lightweight seersucker or cotton, feature subtle ticking or bold regatta stripes, and come in a classic blue and white palette – timeless hues that will ensure your jacket gets good use for many more years to come. Due to their boating heritage, both styles work well within nautical-inspired looks, so look to combine with maritime staples such as navy/white chinos, tailored shorts, boat shoes and Oxford shirts. Just steer clear of the Breton tee unless you’re a seasoned pattern mixer. Perfect For: Those that want to introduce pattern to their tailoring collection. Looks Best: In nautical-inspired and preppy outfits. Key Brands: Zara, M&S, J.Crew, Uniqlo, Ralph Lauren, ASOS, Jack Wills, Hackett. Prefer your tailoring slightly more laid-back? An unstructured blazer in a neutral, seasonally-appropriate hue is the ideal addition to your smart-casual wardrobe. This type of jacket was designed for warm weather; typically constructed from breathable, lightweight fabrics such as cotton, jersey or linen, its unlined construction and lack of padding ensures comfort in the heat while lending it a slightly relaxed air that resonates well with summer’s easy-going vibes. Stick to lighter neutrals such as white, beige, cream or stone here – not only do these hues reflect (rather than absorb) sunlight, they will also combine effortlessly with every other colour you already have in your wardrobe. In terms of how it should fit, steer clear of skinny styles and opt for something in a slim- to straight-cut – this will allow air to circulate easier and, ultimately, keep you cooler once the mercury starts to rise. Able to be dressed up or down with ease, this jacket will quickly become an everyday go-to. Try it with slim chinos, a chambray shirt and knitted silk tie for dress-down Friday in the office, or throw it on over the top of a plain navy V-neck T-shirt and indigo jeans for a night out on the town. Perfect For: Laid-back dressers who want to sharpen up their everyday looks. Looks Best: Teamed with casual and smart-casual pieces. Key Brands: Massimo Dutti, Uniqlo, ASOS, Reiss, Beams Plus, Mango Man, Boglioli, Oliver Spencer, Incotex. Much more versatile than you may initially think, green is a criminally underrated hue that combines wonderfully with all the colours you will already have in your wardrobe – namely white, grey and navy. Not only that, blue and green looks set to be a key pairing for SS15 after it was spotted on the runways at Hackett, Gieves & Hawkes and Burberry Prorsum, which makes this blazer ideal for throwing on with your staple indigo jeans and navy chinos. Whether you opt for fresh mint green design or a darker olive style, our advice remains the same: keep your surrounding pieces pared-back and muted to let your jacket become the focal point of your look. For a foolproof smart-casual outfit that all men can pull off, combine with a pair of navy chinos, white cotton shirt/tee and brown suede loafers. Perfect For: Those wanting to branch out from the safety of navy and grey. Looks Best: As the focal point of an outfit, especially when combined with white, grey and navy. Key Brands: Mango Man, Massimo Dutti, Gant, Suitsupply, Topman, Paul Smith, Charles Tyrwhitt, ASOS. Having finally shaken off their feminine connotations, pastel colours have become a core part of the summer menswear palette over recent years. Soft and subtle, a blazer in a pastel shade – from sky blue and mint green to baby pink and sherbet yellow – makes an eye-catching option for guys who want to start introducing colour to their smarter looks but aren’t quite ready for full-strength primary hues. That said, some pastels are easier to pull off than others. Sky blue, for example, is a hue that all men should feel comfortable donning, while at the other end of the spectrum, yellow and pink cannot fail to garner attention and should only be worn by those who are completely confident in themselves and their personal style. Whichever shade you opt for, try teaming your pastel blazer with chic, smart-casual separates (think linen trousers, slim-cut chinos and cotton pique polos) in fresh neutrals such as white, cream and pale grey to create elegant, Riviera-inspired outfits for any occasion. Perfect For: Men who want to explore coloured tailoring for the first time. Looks Best: Combined with smart-casual separates to craft sophisticated warm-weather looks. Key Brands: Zara, ASOS, River Island, Reiss, Aspesi, Richard James, Mango Man, Gant, J.Crew, Austin Reed, Suitsupply. No longer the reserve of city boys and Gordon Gekko wannabes, the double-breasted (DB) blazer has shaken off its power dressing banker associations to become a modern and stylish option for men that like to look put-together. An undeniably masculine cut, a DB jacket will give the appearance of broad shoulders and a nipped in waist (if tailored correctly), creating a striking and powerful silhouette that some may find a little intimidating. However, this is easily countered by opting for unstructured or soft shouldered designs, which give off a slightly more relaxed feel. Likewise, steering clear of colours traditionally associated with business wear, such as dark grey, charcoal and black, will also help increase wearability on a day to day basis. As for how to style? Look to balance this formal shape by dressing it down with casual staples such as Oxford shirts, tees, chinos and jeans. Perfect For: Those looking for a statement jacket without having to revert to bold colours or patterns. Looks Best: Dressed-down with everyday staples. Key Brands: Suitsupply, Dunhill, River Island, Hardy Amies, Burberry, Mango Man, Noose & Monkey, Zara. Finally, an option for the ballsy and more fashion-forward men in our midst. With prints and patterns continuing to dominate the industry season after season, it was only a matter of time before tailoring got the printed treatment. Would we recommended a floral or camo blazer to everyone? Of course not. But for those that like to push the boundaries of their personal style and have ticked off everything else on our list, a printed jacket represents the final frontier. That said, there are wearable options out there. We’ve seen subtle pin dot, tonal jacquard and muted geometric styles on the current market which are only really noticeable on second or third glance, making them an interesting way of introducing character and personality to your smart-casual ensembles. Of course, the only way to truly pull off such a bold piece of clothing is to anchor it with neutral surrounding pieces, as proved by the lookbook below. But most importantly, you can’t second-guess yourself – this blazer needs to be worn with rock solid confidence, or not at all. Perfect For: Those that like to stand out. Looks Best: Anchored with neutral surrounding pieces. Key Brands: Topman, ASOS, Sisley, Noose & Monkey, Zara, Mango, Ted Baker, Etro, Paul Smith. Casually tailored, endlessly versatile and available in styles to suit every taste and budget tier, the blazer is a year-round staple you can’t be caught without. Whether you’re up for making a statement this summer or keeping your warm-weather wardrobe low-key, these key designs cover all bases. Which brand of blazer is your go-to? And what will you be wearing yours with this summer? Be sure to let us know by commenting below.